Germany's Rocket Internet-backed food delivery service Foodpanda India announced on Tuesday that actress Sunny Leone will be part of their digital marketing campaign. The company said in a press statement that, "the campaign would target the consumers through various social platforms such as Snapchat, Facebook, Twitter, Instagram, etc." The campaign videos can be viewed on Foodpanda's social media properties. 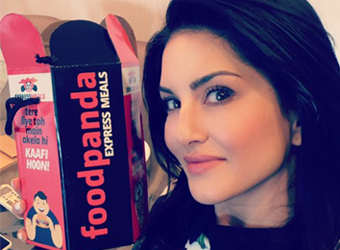 In these short videos, Leone is seen along with her real-life husband Daniel Weber, at her home ordering through Foodpanda and endorsing "to go cashless with FoodPanda." The company also said that, "the short digital campaign would majorly play on Snapchat which is in sync with the content consumption by the users of today." "The sentiment of the campaign talks of what Foodpanda stands for -- convenience, making users feel special and express delivery," the statement added. The campaign uses hashtags on Twitter like #FoodPandaToTheRescue, #WhenIamHungryIJingle and so on. The adult movie star-turned- Bollywood actress has 1.68 million followers on Twitter. Gagan Arora, chief marketing officer of Foodpanda India said, "Post the announcement of demonetisation, if you are low on cash and want to have your favourite dish, Foodpanda is exactly what you need. We are extremely delighted that Sunny Leone is a part of our new campaign around the cashless pocket ATM." Foodpanda in India is not a profitable venture for parent Rocket Internet. Saurabh Kocchar, CEO of Foodpanda India had told, in an interview to The Hindu Business Line that the company will be "profitable by FY19." The Times of India had reported that Foodpanda is "desperately searching for a buyer for its troubled India operations at a lowly price tag of $10-15 million." Last year the firm was hit by allegations of irregularities in its operations involving fake restaurants and orders. As part of its efforts to stabilise operations, Kochhar had said he was deactivating 500 to 1,000 restaurants a month. There were also alleged discrepancies in the number of restaurants (12,000) on its network; its ad campaign contract of about Rs 3 crore with a firm named Crazy Boyz Entertainment Pvt which apparently belonged to co-founder and managing director Rohit Chadda who resigned from the company in August last year, his brother and another person; and its partnership with Capricorn eServe, a Gurgaon-based call centre that managed Foodpanda's back-end processes. Can the tie-up with Leone revive its brand image? "If Foodpanda is looking for glamour, it is fine because Sunny Leone brings that to the party. She is a well-recognised face and brings glamour to whatever she is associated with," says Harish Bijoor, a marketing and brand consultant based in Bangalore. Bijoor adds, "But if you ask me if there is a correct fit between Sunny Leone and Foodpanda, maybe no." Founded by Chadda, Amit Kohli and Akhilesh Bali in April 2012, Foodpanda features location-specific listing of restaurants on its site. Users can check out menus, along with special offers, post which they can order and get food delivered to their homes. One can also search for restaurants according to cuisine, and/or by other parameters such as vegetarian/non- vegetarian, healthy food, etc. "Definitely, she will get the eye balls for the firm. It is about getting the message viral. In the digital platform, we are always looking for the messages which can be viral," says Nalin Khanna, group MD and CEO of Vertebrand Management Consulting. Khanna adds, "They must be having a low budget, so digital campaigns are better for them. But there is no distinct proposition that 'why should I come to Foodpanda?' These firms are all depending on discounts to attract customers." Foodpanda had raised $100 million in funding led by global financial services giant Goldman Sachs in May. That round took the total funding raised by Foodpanda to $310 million. Leone, who has worked in films such as Jism 2, Jackpot, Ragini MMS 2 and Ek Paheli Leela, is a brand ambassador for adult products e-store IMbesharam.com. Earlier this year, IMbesharam.com secured $4 million (Rs 27.2 crore) in Series A funding from two unnamed US-based angel investors.